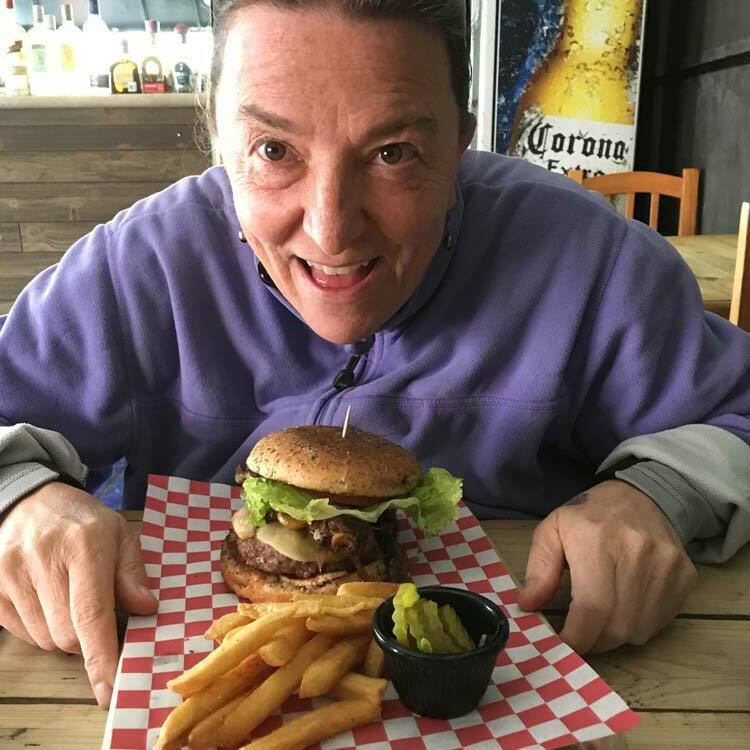 This post covers Fran’s second week in the town of Ajijic in the State of Jalisco, on the north shore of Lake Chapala. Fran and I had a brilliant Skype video call yesterday (Tuesday) at a café called Black and White in the Plaza. Fran propped her phone up on the table so I could see what was going on while we talked. It wasn’t too busy and no one took the slightest notice. We were careful not to have the volume up too high. After a while, Fran saw someone she knew and called her over: a lovely lady called Paula from “the other Portland” (the one in Oregon!) The three of us nattered away as though we’d all known each other for years. Paula seemed amused and delighted that I felt so fully present with them there. Fran asked Paula about the “Super Blue Blood Moon” happening today (Wednesday), but the 6 a.m. meet up at the lakeside was just too early for Fran to contemplate! They plan to meet up on Thursday, though, to visit the hot springs which are a short bus ride away. Fran visited the Black and White café again yesterday (Wednesday). She is great at connecting with new people she meets on vacation (“I do better with strangers than friends.”) Later, she messaged me: “Hanging out with friends,” and had a “deep deep talk” with one lady. We managed a short video call as I walked to the Metro station for the train after work. It was fun to show Fran the route I walk every day. My evening was busy and satisfying. I watched a TV programme about the influence of the moon on life on earth (likely scheduled because of the Super Moon thing) and chatted online with a couple of friends. Later, I found some great music tracks on YouTube and made a decent start on a new piece of writing; about our book, suicide and suicidal thinking. It was about one in the morning when I went to bed. Fran went to the hot springs at Hotel Balneario yesterday (Thursday). It didn’t exactly go to plan. Fran showed me the leaflet. I located the place on Google maps and sent her screenshots to show where she needed to be, whilst simultaneously tracking her on Glympse. A nice lady on the bus helped by telling Fran where to get off. Finally she was there, and met up with her friends. She had a good time, and got a ride home, just missing a torrential downpour. We had a thirty minute call when she got back. She was cold, hungry, and grumpy. 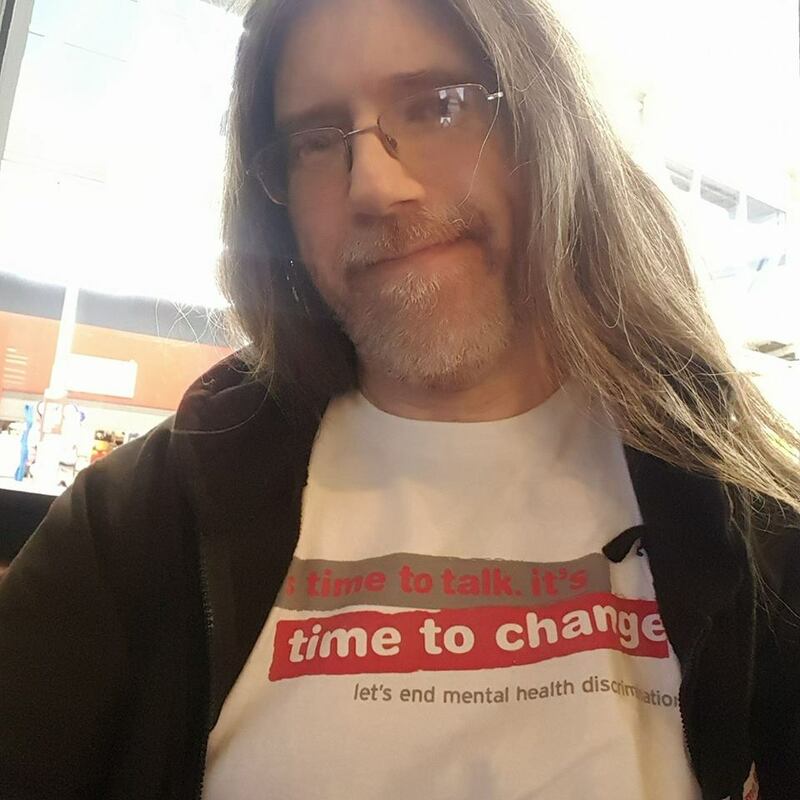 Thursday was #TimeToTalkDay here in the UK and I wore my Time to Change tshirt into work. I was back on Facebook after my little break, and had a good conversation on one of my posts about the value (or otherwise) of awareness events like this. At work, I had three mental health related conversations. That’s not at all unusual, actually: testament partly to the “looking out for each other” ethos my boss Judith engenders in her team. Fran’s been busy today (Friday), including a tour round some local properties with a realtor (estate agent) which she arranged the other day. I messaged her when she got back. Right now, she’s at Isabella’s restaurant meeting friends for dinner. I doubt we will have any calls until tomorrow. I could have done with a natter, but it’s okay. My day has been full—and heavy. I have been wrestling with one long-term friendship for a while and it kind of came to a head today. One in which I have struggled to accept the reality that I am not meeting my friend’s support needs, and our relationship is not meeting my needs either. Not a failure, but a reminder that caring for someone isn’t always enough, and that we need to keep an eye on our own well-being as well as the other person’s. I have been out most of today (Saturday) with my family for my son’s Michael’s birthday meal. Mike is a fantasy novelist, blogger, and cartographer. You can find him on Twitter, Facebook, and on his blog. Fran has also been out, first for brunch and now visiting some gardens. She posted up a gorgeous sunset photo last night from down by the lake. Unfortunately, things didn’t go so well as she made her way home. The photo showed some dried blood, minor cuts and scrapes on her nose and upper lip. I’m hoping it won’t look too bad once she has cleaned herself up. But it will be sore and I know she will be concerned that she let it happen. The roads are pretty uneven and cobbled. That might be how it happened, although if she had been drinking too much that likely contributed too. I just have to trust that she’s okay. We may not get to have a call or even chat much more today, as she is invited to dinner later with some other friends. There are times when the miles between us matter very little. And there are times like this. Fran rested in the afternoon yesterday (Saturday) after her trip out for brunch/gardens. We got to catch up on chat later, before she went out for dinner with her friend Helen. She is planning a resting day today (Sunday), and wants to work on her photos and finances. She plans to watch tonight’s Super Bowl if possible. I found an iPhone app (Televista Deportes) which might work, if she decides not to go out anywhere to see it. We’ll see. I’m hoping we will connect for a call at some point. She sent another selfie: she has a cut to her upper lip and a bandaid across the bridge of her nose, but she managed a smile and I don’t think there will be too much bruising, nor a black eye. I enjoyed yesterday (Sunday). I cooked lunch for my wife and son, went out for coffee and a few groceries, and spent the afternoon watching Columbo. I also chatted online a bit with a couple of friends. It’s good to have people you feel comfortable and safe with, to share whatever might be going on for you without being judged. I feel fully “caught up” again with Fran. We had a couple of voice calls through the day. We did a bit of “work”—we selected ten of her photos from the past week, emailed them out to her “postcard from Mexico” mailing list, and also posted them on Facebook. Best of all, we watched the Super Bowl! Fran hadn’t wanted to go out anywhere and there wasn’t a TV available to watch it on in the apartment. After exploring a few options we found the best way was for me to have the game playing on my PC on the BBC Sport website. I then shared my screen with Fran via Skype. 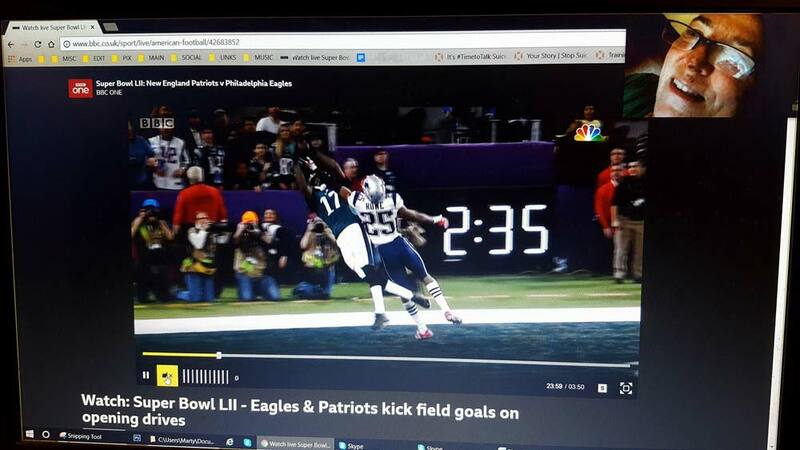 It meant we could be together on webcam and watch/hear the game at the same time. The picture was a bit “watercolour-y” at Fran’s end. 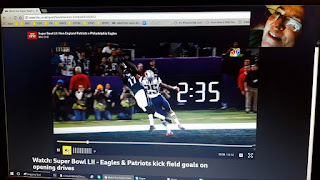 I pointed out it was probably easier to watch than in previous years, when Fran shared the Super Bowl experience with me by pointing her webcam across her apartment at her tiny TV! I focused my energies yesterday (Monday) on my writing and blogging, and replied to a very exciting email regarding a new opportunity in the mental health arena. Fran was really tired when we met on Skype last night (early evening for her). She is allowed to be tired of course, but it felt more than that. When I notice something that could potentially be more than it seems, I bring it into the open. Sometimes Fran will want to explore it, sometimes not. Last night, not. Instead, we talked about what's coming up in the next few days and I read more from Outlander, the novel we are reading together. After our call, Fran had an invitation to watch a movie with friends, but decided to stay in and rest until bed time. We’re just over half-way through this trip. Later today (Tuesday) Fran will move from this apartment to another one nearby, where she will stay for the remainder of the trip.Tomorrow she has her first appointment at Dental Express, which is what started all this in the first place. It’s been quite an experience so far. Full. Exciting. Moving. Challenging. Painful—especially for Fran’s nose. I can’t wait to find out what happens next!